An intra oral treatment includes the neck, head, facial muscles, jaw and the muscles of mastication from outside and within the mouth. 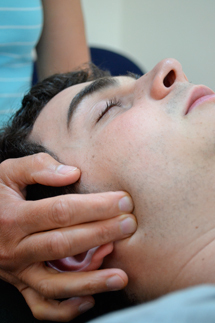 It improves the alignment and balance of the jaw, head and neck with the release of muscular tension. The temporomandibular joint (TMJ) is where your lower jaw, the mandible, connects to the side of your skull. Place a finger just in front of your ear and slowly open your jaw and you will feel the joint moving. This complicated joint allows your jaw to do complex movments such as chewing, yawning, talking and expressing emotion. Movement is controlled by 5 muslces. The rounded end of the lower jaw (condyle) sits in a depression (glenoid fossa) in the skull. The fossa is steep at the back, but has a gentle slope of bone at the front (articular eminence). Above the condyle sits the articular disc. As you start to open your jaw the condyle rotates in the glenoid fossa, as you open your mouth wider the condyle slips forward and down over the articular eminience. The articular disc moves forwards with the condyle allowing a smooth motion and giving shock absorption whilst chewing. 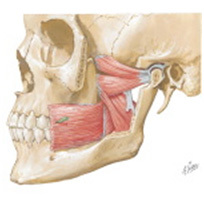 One muscle (lateral pterygoid) is responsible for pulling the articular disc forward when the jaw opens. The five muscles need to be balanced to allow smooth movment of the jaw and the articular disc.